During the May Bank Holiday, I visited Cambridge where my youngest son has just moved to. Bob and Natalie have rented a lovely terrace house with a south facing garden, jealous or what! I took lots of pictures with my camera, my OH took lots with his phone, we looked at them on the evening we came home then........ nothing. These are a couple of my pages, I actually made 5. 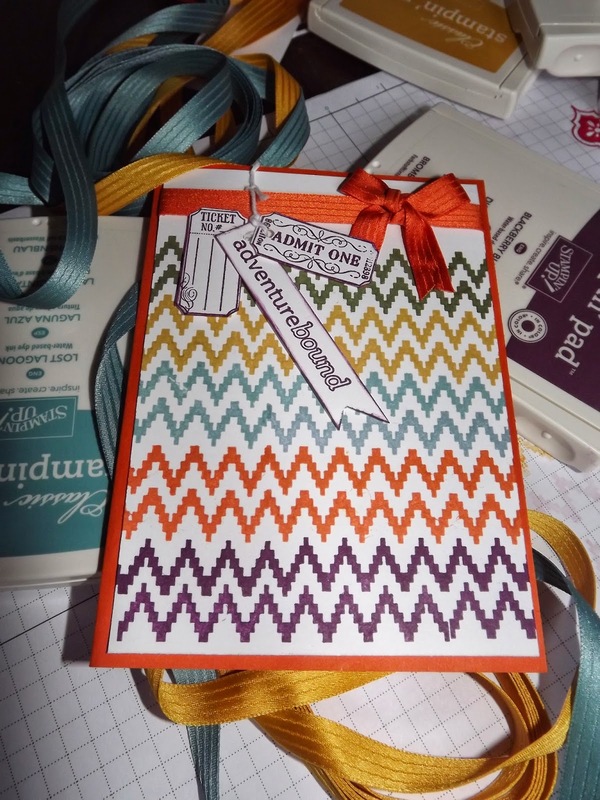 Tomorrow I will show you what you get in project life to make your pages with. This is the last card in the tin. The base of the card is the same designer paper as the tin punched with the scallop punch along one edge layered onto a piece of Blackberry bliss layered onto a piece of crumb cake...... well I couldn't do a whole tin full without any crumb cake could I! 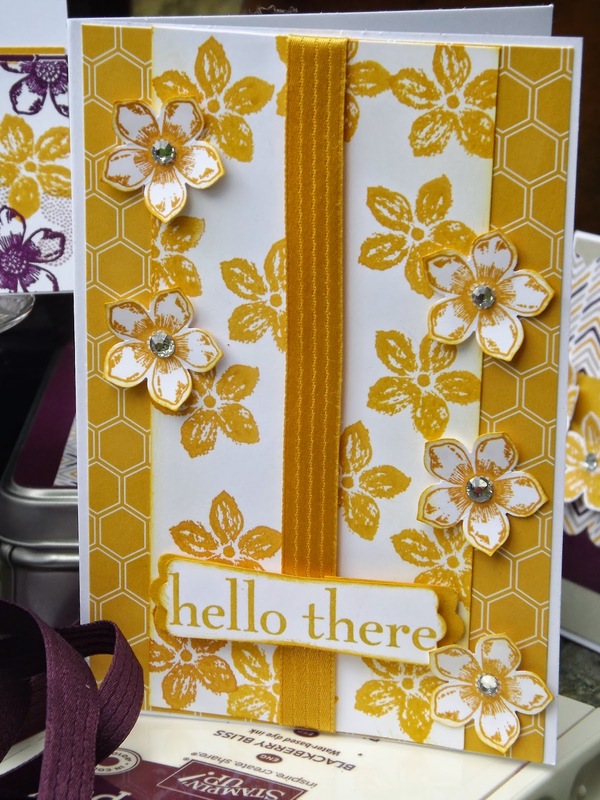 I have added a thin strip of hello honey across the middle to attach the flowers to The bow is in the lovely Hello Honey ribbon, its like liquid sunshine. The sentiment is the Love Labels stamp and punch. Another bundle set in the current catalogue at 15% off. You could add rhinestones to the centre of the flowers if you wanted some bling. 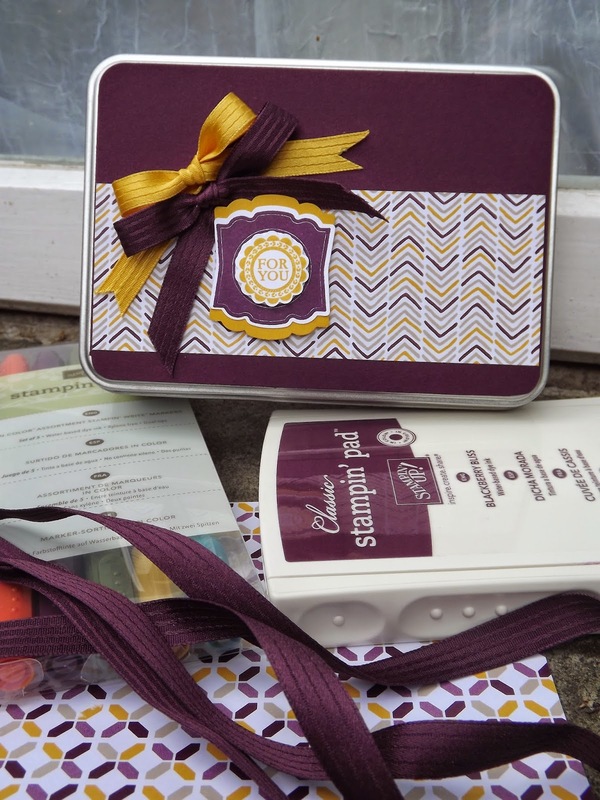 Through a link up with Becky Higgins, Project life products exclusive to Stampin'Up! are now available. Watch next week as I bring you my first attempt. And I am hooked!!!! Its quick and easy to write the story of your families latest adventure. Mine will be starring 'Albie' my youngest sons kitten. Make sure you check back to look on Monday. Todays card is another single colour card but quite different from the first. This one is Blackberry Bliss. 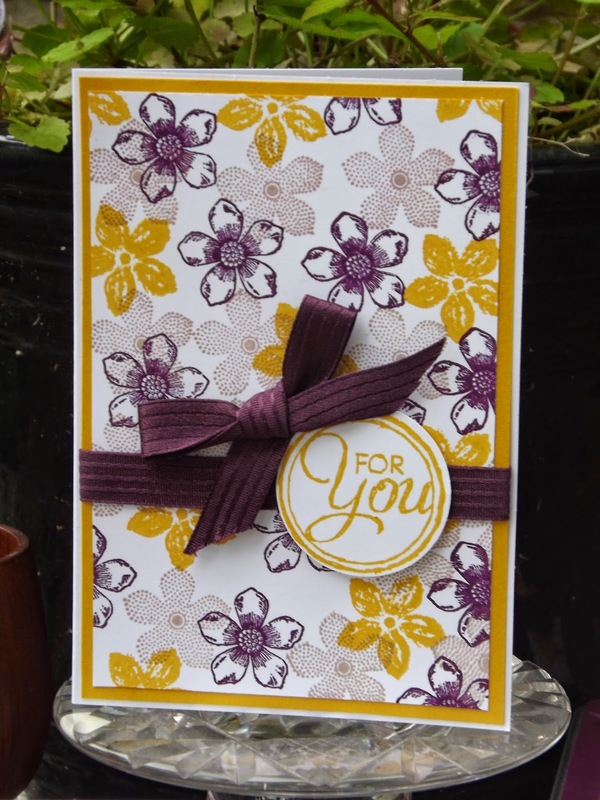 I have used the Gorgeouse Grunge stamp to create the background for the flowers. This stamp with the little dots on is so useful. I have them continued to use the Blackberry Bliss ink and stamped only a few flowers amongst the dots. I have stamped one onto scrap card and punched out for the main flower centre. The third card in the tin also uses a piece from the one sheet wonder. I started by stamping the sentiment! Mainly because if this doesn't stamp as beautifully as you expect or you smudge you design a different card to cover the mistake! This stamped beautifully. There are so many lovely sentiment stamps in the catalogue. I have layered the one sheet wonder onto a 'sliver' of each colour of card. Then punched out the flowers using the Bo Ho blossoms punch, middle size flower and the Itty Bitty punches for the middle bit. This small set of 3 punches is also on the retirement list , I have then added a rhinestone. I think this has to be my favourite card out of the tin. Today we continue with cards in the tin. I wanted to have the 2 main colours used as a single card. Today we have Hello Honey in all its glory. This stamp set bundle in the spring summer catalogue is such good value for money and only available for another week as a bundle, saving you 15%. I have used it with 2 of the new colours, Blackberry Bliss and Hello Honey. These colours go so well together. The designer paper is a sneak peek at one of the paper stacks in the new catalogue, available from July 1st. This week all the cards will be what I made to go in this tin. The first card was made using the 'one sheet wonder' method. I stamped a full A4 sheet of card with the three flower stamps in the three colours, leaving a little white space. Its best to start with the darkest colour then the next and lastly the lightest. Then you will need to go back and add more to fill up some of the spaces. I layered this onto a piece of the Hello honey. Stamped the sentiment inHello Honey and punched out then used the Blackberry Bliss ribbon for contrast. Here are the last 2 made with this stamp set. So versatile. All of these are stamped with the new 'In Colours" they are really lovely. These two are very simple, random stamping over the page then a sentiment. I would be pleased to receive either they are so bright and cheerful. This card has a very different feel to the previous 2. But uses stamps from the same set just in a less organised way. The tangerine twist colour really pops . Using one of the stamps to give a leaf effect I used the Mossy Meadow, but stamped off first to give a lighter touch. Keeping the sentiment simple works well as the foliage and flower is quite busy. I think this set might stay on my desk! Stocks are running low so get your order in quick only available while stocks last FREE if you place an order over £60. contact me soon. New to Satmpin'Up1 are blendabilities. They come in packs of 3, 3 shades of one colour. I have used the Rich Razzleberry as this is one of my favourite colours. I punched out the flower then coloured trying to get the petals to fade from dark in the middle to light at the edge. It does take some practise. When you are colouring it all looks very dark but as it dries it fades out giving a smoother colour. The style of card is an old favourite with a punched out piece which gave me an opportunity to show you one of the papers in the new paper stack. I have then used the punched out flower, sponging light around the edges and adding a pearl. The card colour is Blackberry Bliss, one of the new 'in colours' I know I shall use a lot of this. For this card I have used 2 further stamps from the Ikat set. Its a bit fairisle like, you know golfer jumper style! Again this has been stamped freehand, its so easy with the polymer stamps as you can see through them. The colours used here are from the new 'In Colours' Lost Lagoon and Hello Honey. The tags are made with the tag top punch which I have used to make a very special card which I will show you on Monday. The make a wish stamp set was still on my desk from last week and I do like it..... can you tell? With an order of £60 you get a free set of the new polymer stamps this month. This is one stamp in the Ikat set. This card gives you a sneak peek of the 2014 -2016 In Colours and they are lush!!!! Tangerine Twist, Blackberry Bliss, Blue Lagoon, Hello Honey and Mossy Meadow. The pattern is stamped with one stamp and I didn't use the Stamp-a-ma-jig. It was so easy. The 'adventure bound' stamp is from one of the new project life stamp sets. If you have just had an addition to the family or other major family event such as a wedding or baptism, what have you done with all your photos ? In a box, on your phone/laptop...... Project Life is for you. This is the art of memory keeping. Contact me for more details. I ve used 3 punches on this card. The label punch has been around for a while now and fits this particular stamp really well. Newer are the tag top punch which takes a 2" wide piece of card and creates a very professional looking tag top. I could have rounded the bottom corners but decided that would soften it more that I wished. The chevrons or arrow points going up the side are the punch outs from the chevron punch. I still have the piece of card them came out of to use on a card next week so come back and take a look!. 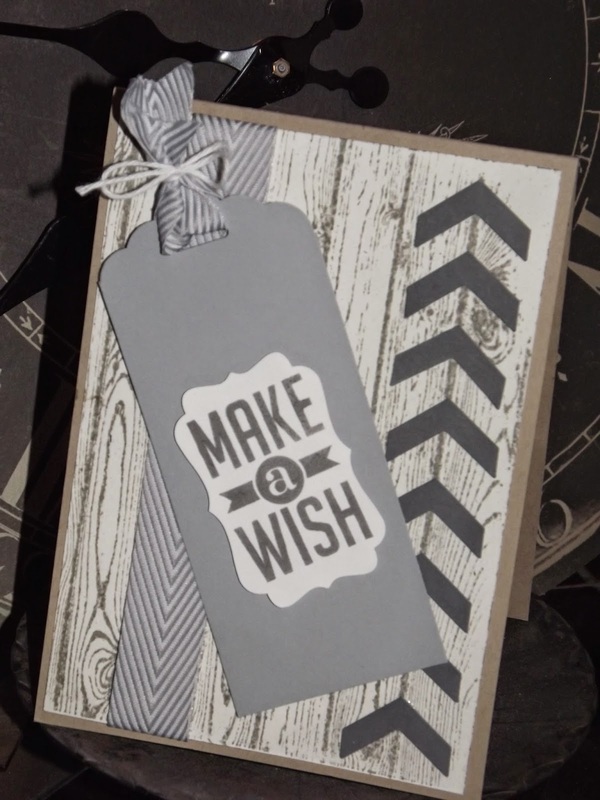 The background is stamped with the hardwood stamp, I think this is on everyones desk or on their wish list Here it is stamped in basic grey on the white naturals paper, which is something I haven't used much. Give it a try, it is a bit different. Just the smokey slate chevron ribbon to finish it off. Great male card, I think. What do you think? Here we have a bit of orange with a twist. I have used the Happy Watercolour stamp set with Tangerine Tango, Pumpkin Pie and Crisp Cantaloupe. The 3 shades look good next to each other as paint swipes. The flower is from the same stamp set, stamped in early expression then painted with the aqua painter. This has allowed me to give it some depth of colour. I have stamped the sentiment in early expresso and added a giant pearl in the centre. These giant pearls are only available whilst stocks last so if you need some get in contact as soon as. Love this Designer Series Paper and just knew what I wanted to do with this particular sheet. The wisteria wonder is one of my favourite colours. I have used pool party rather than coastal cabana to give a more subtle effect. Although I like the bright colours I wanted to create a softer effect on my card. I have stamped crushed curry card with so saffron ink for the yellow flower as that did look very pale on the very vanilla card. the leaves are made with the bird punch and the bow done with pool party seam binding. Circle punch art. At stamp a sack. I found this idea on pintrest but can't refind it. So thanks to the person who first pinned it. Its great. Just a bit of fun using two circle punches and the dotty paper from the large paper stack. I have used the chalk pen to draw in the legs. This piece of kit I wouldn't be without now. I even used it to mark out a pattern on some fabric the other day. The googly eyes I had left over from a christmas make. It was my Stamp a Sack last Sunday. We made 10 cards in 2 1/2 hours plus tea and cake. This is the first card. One for the men, something many of us find more difficult to make. This one is a case of less is more than enough. I've used the hardwood as a background, love this stamp. Threaded the chevron hessian through the punched parts. Adding the cut outs from the chevron punch just finish it off. 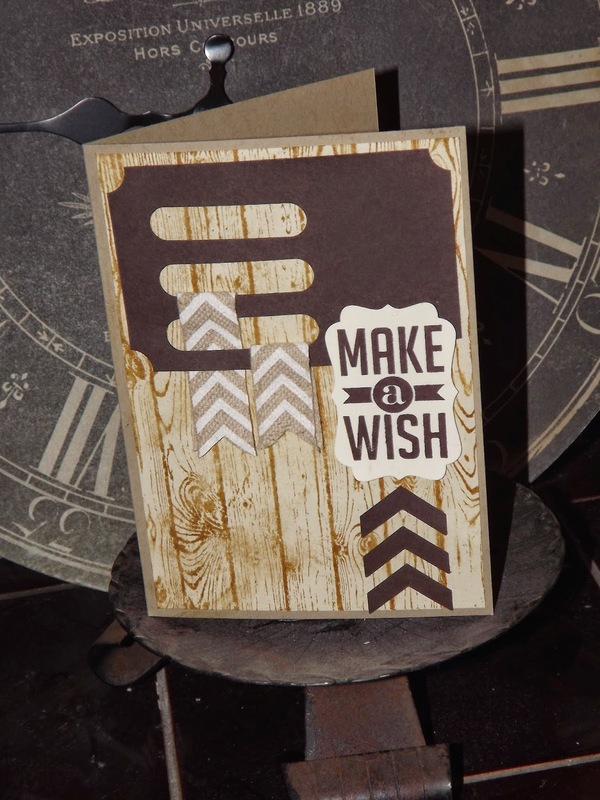 Stamping the 'make a wish' and punching out with the label punch was an idea I found on pintrest. Lifting it on dimensionals just finishes the card. 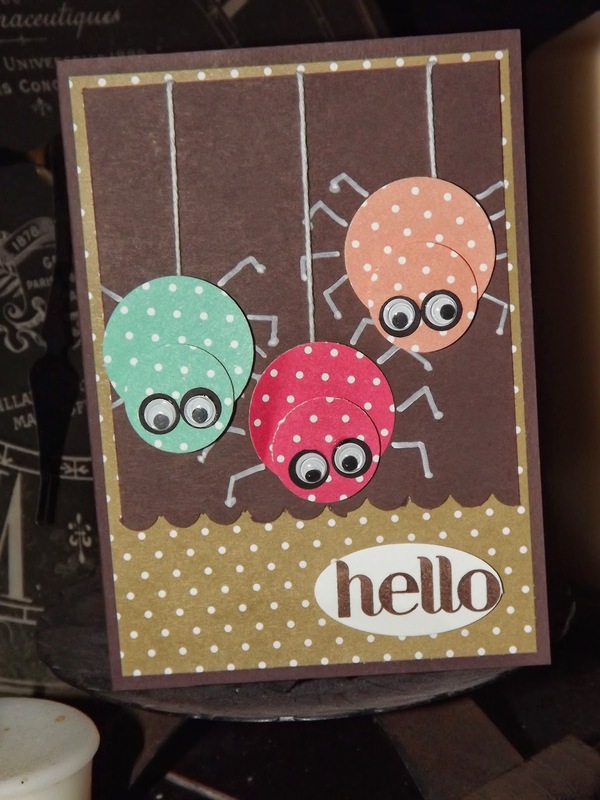 Using Stampin'Up! card, pink pirouette and brushed gold and the Stampin'Up!clay I have created a set of wedding stationary for my best friends son and soon to be wife. They chose the colours and the theme after I had created a selection of samples. They loved the clay feathers which are coloured with Stampin'Up! markers. I used the fine feather stamps on the RSVP envelope and the evening invitations. 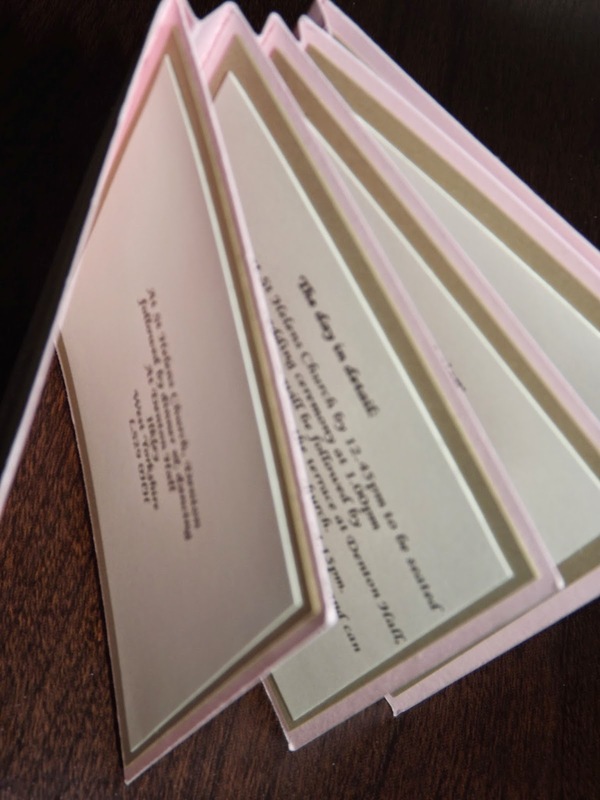 Once we had all the information on the small 3" x 3" squares of paper they decided they would like it making into a little book, which was a very snug fit in the box. The folding box idea was courtesy of Francis Martin (see blogs I follow). If you would like your wedding invites made to your own design (with a little help from me) get in touch to arrange an informal chat.